Known as Pleasant Valley because of its beauty, there were times past that were not exactly pleasant. In the 1880s, it was the scene of “The Pleasant Valley War.” Arizona legend has it Zane Grey based many a novel on stories from the deadly feud. With its abundant grassland Pleasant Valley became known as the perfect place to raise cattle and, though not easy to get to, cattlemen began to homestead there. Several ranches had already been established by the mid-1880s when a feud began between two ranching families that had been previously in business together. The “War” finally ended when the last man on one of the sides was killed in the early 1890s. The Young family bought the man’s ranch, and one of its daughters became the postmistress. While applying for a post office, the woman used the name “Young,” as the name “Pleasant Valley” was already used in another part of Arizona. 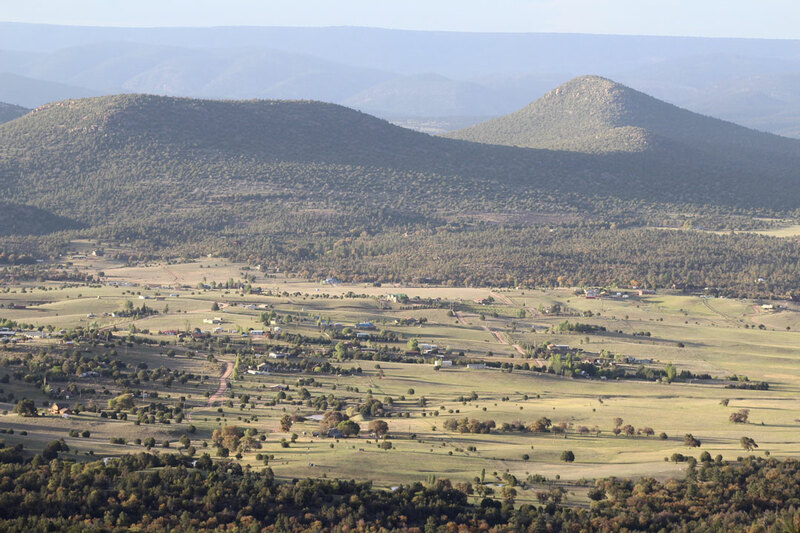 Today, there are still many ranching families in Young, which maintains its rural lifestyle completely surrounded by the Tonto National Forest. It is not, however, the area’s only forest. At the base of the Rim lies the Hellsgate Wilderness, known for its very remote setting that offers hiking, camping and seasonal fishing. South of Young is the Sierra Ancha Wilderness, known for its rugged beauty as well as its pre-Colombian Native American ruins. Young offers lodging with colorful names, such as the Dead Broke Inn, the Cherry Creek Lodge, the Pleasant Valley Inn and Grandpa’s Cabin. looking for the standard lodging and eating chains, you will not find them in Young. What you will find is refuge from the traffic and stress of big city life. President James Bruzzi, with the Pleasant Valley Community Council, has owned property in Young since 2006, but has been living there full-time about four years. As for places to stay, Young offers lodging with colorful names, such as the Dead Broke Inn, the Cherry Creek Lodge, the Pleasant Valley Inn and Grandpa’s Cabin. Food and beverage awaits you at Antler’s Café and Bar, Purple Sage Farm, Bruzzi Vineyard and Merle and Kathy’s Valley Bar, all located on Highway 288. Open many weekends throughout the year, the Pleasant Valley Historical Society Museum is a must for visiting to learn about the area’s incredible history. The Fall Festival will be 5-8 p.m., Friday, Oct. 26, at Young Public School, on Highway 288 at Baker Ranch Road. From 10 a.m. to 6 p.m., Saturday, Oct. 27, is the Pumpkin Festival, followed by a Halloween Party from 6-10 p.m., at Bruzzi Vineyard, 47209 N. Highway 288. A Thanksgiving feast begins at 4 p.m. Thursday, Nov. 22, also at Bruzzi Vineyard. Young will hold its Holiday Bazaar on Thursday, Dec, 1, at the Pleasant Valley Community Center, on Highway 288. A Winter Equinox Wine Dinner will be held, beginning at 6 p.m. Saturday, Dec. 22, at Bruzzi Vineyard.